The guppy, also known as the rainbow fish or the million fish, is a popular freshwater aquarium fish. The preferred environment is a water ph between 7 to 8.1 and a temperature between 25.5 and 27.8 degrees c (78 and 82 degrees F). 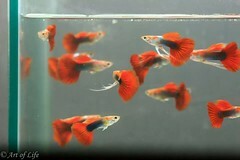 Guppies are prolific eaters and not unknown to grow overweight. The aquarium guppy should be fed a small amount of food, once every day. The best foods are “live”, for example, microworms and baby brine shrimp. These small organisms live in the aquarium alongside the fish, which means that there is no risk of fouling the water from decaying “dead” food. There are vacation feeders available, useful when the aquarium owner goes absent. However, he should test the feeder beforehand to ensure that the item works effectively in the aquarium. It is important not to underfeed the fish, especially if there are young fish present, since the guppy is known to eat its own fry. The male guppy is 1.5 to 3.5 cm in length, while the female is 3 to 6 cm. The males are spotted, striped and splashed in various colors, while the female is gray. After being inseminated by the male, the female guppy can store sperm and fertilize her ova for up to eight months. The breeding period runs throughout the year, with the gestation period being between 21 and 30 days. She gives birth to live young. Like other species, the million fish is prone to disease. The fish are sensitive to various fungi and bacteria, typically attacking the mouth and the fin. A very visible disease is saprolegnia, which appears on the fish body as flat, white patches. Most often, the fish is poisoned by water that is too hot or cold, too acid or alkali. If the tank is overfull with other fish and aquarium plants, the guppy is at risk of carbon dioxide poisoning. Water that has been fouled by decaying food and other dead fish is also poisonous to the million fish. The aquarium owner should take steps against disease by not overfilling the tank with plant and fish life, cleaning it out regularly and checking ph and temperature levels, routinely.